Our marketing literature provides general and specific information about our products, services, capabilities and applications within particular markets. Pyromation’s capabilities brochure describes the company’s operating philosophy, capabilities, services offered and product line. It is a broad overview of the entire enterprise and provides a succinct summary of the company and people that produce the finest temperature sensors in the world. This one-page (two-sided) flyer provides a quick summary of the company behind the sensors. On one side it briefly describes Pyromation’s capabilities and services. On the other side there’s a quick synopsis of the basic product types the company produces. 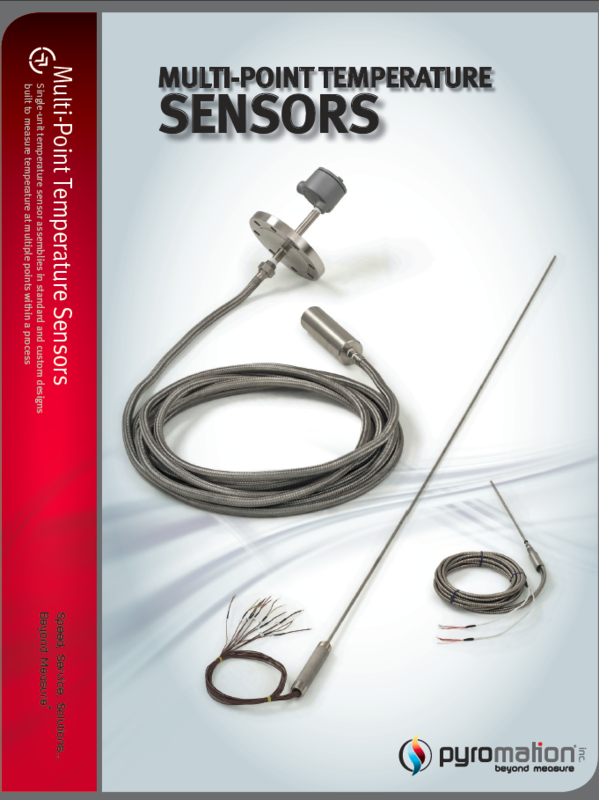 This brochure provides a general summary along with specific product configurations for Pyromation’s standard Multi-Point temperature sensor product line. Custom designs are also available – contact Pyromation with specific requirements. Pyromation offers a comprehensive line of Bi-Metal Thermometers, outlined in this brochure, which are ideal for use in measuring temperature and providing a local visual reading of material in a process piping system, holding tank, vessel or other application. 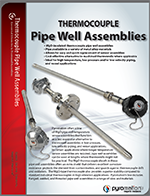 Pyromation’s line of MgO Thermocouple Pipe Well assemblies and replacement elements are defined in this Product Guide. These assemblies serve as less expensive alternatives to thermowells for specific high-temperature, low-pressure, low-velocity applications. 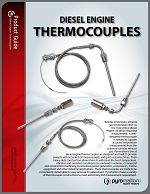 The complete line of diesel engine thermocouples offered by Pyromation is described and defined in this Product Guide. Single- and dual-element sensors are available with optional fittings for applications where diesel engine exhaust gas temperature measurement is required. 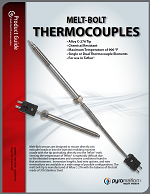 This Product Guide describes a special Melt Bolt series of thermocouples that feature an Alloy C-276 tip. The applications, specifications and order options for these sensors are outlined in this piece. Pyromation’s new line of General Purpose, screw-cover connection heads are featured in this flier. It includes a brief description of the benefits and overview of the types of heads available. The catalog pages for each connection head category provide more detailed information and part numbers for ordering. Pyromation’s Compound Mixer Temperature Sensors brochure provides information on the company’s tough line of special sensors, which are primarily designed for rubber compound mixing equipment applications. Product options (including special coated tips), product constructions, ordering codes, specs and technical data are included in this piece. This catalog provides information on Pyromation’s Thermowell product line, as well as technical information needed to determine which well is best for each application. The catalog includes product specs, part number configurations, application information, photos and engineering drawings for each thermowell category manufactured in Pyromation’s Fort Wayne, IN facility. Pressure tables, a corrosive service guide, thermowell options and the services offered by Pyromation, such as Wake Frequency Reports, are described in this piece of literature. Pyromation offers a complete line of miniature temperature sensors, including ATEX certified designs, for babbitt bearing and miniature bearing applications. This brochure provides the technical and instructional information associated with these sensors. This piece of literature features Pyromation's capabilities for our temperature transmitters. This one page publication features our CIP RTD Sensors and Accessories. Included are General Purpose CIP Sensors, Tank Sensors, Thermowells, and Transmitters. Clean-In-Place units are provided with a Number 7 polished finish which exceeds 20 uin Ra. They meet or exceed finish requirements set forth by the 3A Sanitary Council Standard. 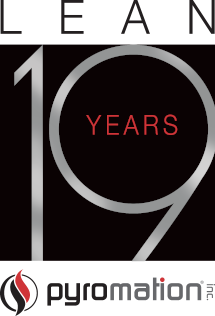 This one page publication features our Industrial Market Product line. Included are Thermocouple Elements, Protection Tube Assemblies, MgO's, Thermowells, and Digital Indicators. These units are used in applications such as heat treating, forging, incineration, and other severe use processes. They are suited for high temperatures and vibration resistance.